SugarDaddyMeet is a place where young women can meet a sugar daddy, millionaire or wealthy benefactor for a mutually beneficial relationship. There are no joining restrictions but members can obtain optional verification of their profile details such as income, photos and assets. The purpose of SugarDaddyMeet is to bring together wealthy men with young, attractive women. They only list profiles of male sugar daddies and female sugar babes. Their other website, OlderWomenDating is specifically for women seeking younger men. Joining takes a matter of moments and is accomplished via the sign up form on the home page. There are no specific requirements to join, though as a matter of choice you can have your profile and photos verified by uploading the necessary documents. After being verified you'll receive a special badge to show you've taken this step. Adding some private photos can be an excellent way to break the ice and initiate contact with others. Although you aren't required to complete the extra sections on your profile, it's a good idea to add as much detail as you can. As a guest user, you'll need to add a photo before you can do certain things such as send people winks and likes. The statistics show that profiles with photos receive about 20 times the views of those without. You can upload both public and private photos. If someone wants to view photos in your private locker they'll need to ask you first. The site is actively moderated to ensure the safety of users and keep scammers out. That said it pays to be vigilant and take the usual precautions. As a Standard member you will only be able to respond to emails sent by Gold members. To initiate chat sessions or send messages you will need to upgrade to a Gold Membership for a monthly, quarterly or yearly fee. A single month's membership costs $29.95 - this is cheaper when you subscribe for longer periods. Once you upgrade your profile will appear before free members in searches and you gain access to additional information such as other people's last login time, compatible matches, and it allows you to check who liked your photo on the Let's Meet page . As well it unlocks the advanced matchmaking searches allowing you to find people by appearance, distance from you, whether or not they have a photo and more. Reverse matches and compatible matches are additionally provided to help you find people who are looking for someone with your qualities. SugarDaddyMeet is specifically designed for arrangement type relationships. 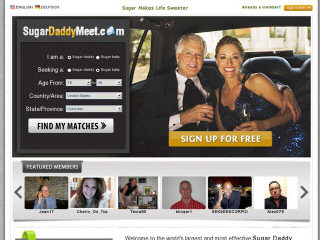 SugarDaddyMeet.com is definitely for the individual who knows just what type of relationship he or she is looking for. It is very specific to the needs of sugar daddy/sugar babe relationships. Those who don't fit this category of relationship, would be better off looking to other more general dating sites. This will avoid any misunderstandings. If you're more comfortable on mobile, their app is available for iTunes. Rss Feeds. Subscribe to comments for this site. [?] Receive updates about Sugardaddymeet.com directly through your newsreader. This site is awful, please steer clear. I have been in single for so many years and i need a man who is honest and love in true heart and be with him in all my rest of my life and get kids with him of good family.. I need a sugar daddy to take good care of me and I promise to do thesame and make him satisfied and happy. I am looking for a man who can appreciate me.. Kind...honest and a gentleman. I'm looking for a rich friend it doesn't matter a male or female 2 pamper me and he/she will have my friendship for return :) i'm sure u gonna love me. My name is angel, 29-years looking for a good time a friend and someone to spend money. SugarDaddyMeet.com is definitely a site for the individual who knows just what type of relationship he or she is looking for. It is an ideal place for Sugar Babies to find their Sugar Daddies and vice versa. The site offers dating tips and advice especially suited to the type of relationships. I want to know more about it. I'm looking for a sugardaddy for real, probably marriage and father my child. SugarDaddyMeet 2.42 12 A review of SugarDaddyMeet. SugarDaddyMeet is a place where young women can meet a sugar daddy, millionaire or wealthy benefactor for a mutually beneficial relationship.